Preheat the oven to 200C, gas mark 6. Mix together the lemon zest, half the garlic and a dash of the oil, then rub over the salmon. Season, then set aside for 5 minutes. Put the tomatoes in a roasting tin, toss with the remaining oil and roast for 5 minutes. Add the salmon and roast for 8 minutes until the flesh flakes easily and the tomatoes are soft. Mix in the capers and 1 tbsp lemon juice. Meanwhile, put the frozen petits pois, the basil (stalks and all), remaining garlic and the stock in a pan. Simmer for 5 minutes, then whiz in a food processor to a chunky mash. 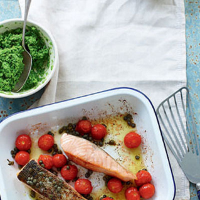 Serve the mash with the fish, tomatoes and juices, and perhaps some extra basil leaves. Aromatic, grassy and full of gooseberry fruit, this fabulous New Zealand Sauvignon is perfect with the green tones of pea and basil mash.